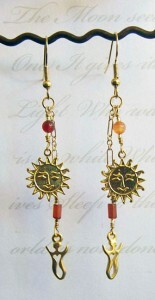 Today’s listings in my Etsy store featured the Carnelian Healing Sun Goddess Series. I chose to list these on a Sunday because that’s the day sacred to the Sun (SUNday) and because of the fiery orange/white color of these beautiful stones I discovered in a bead shop long ago. They are paired with Gold – it being the Sun’s metal, of course. Carnelian is a healing stone, according to the renowned pagan author and Wiccan practitioners Scott Cunningham & David Harrington in their wonderful book, Spell Crafts – Creating Magical Objects. For those who practice Yoga and pay attention to their Chakras, The Chakra Bible has much use for Carnelian. It is used to balance the Muladhara, the Sacral Chakra and can be used to reduce back pain. It also assists with rheumatism, arthritis and kidneys to balance water regulation of the body. It is associated with the Hara/Navel chakra’s orange/yellow colors, thus helping with digestion and absorption of nutrients. Regarded as a protective stone, Celtic warriors carried it mounted in jewelry or their armor to accompany them across the Great Divide or Afterlife. I love the books I found in my library to help do the research – the are fascinating! Spell Crafts and The Chakra Bible are invaluable resources for those interested in Chakras and/or color magick. They can be found at your favorite online bookseller. Today’s Daily Om really spoke to me. As with yesterday’s article, my comment centered on the importance of balance in one’s life. Western society (and now, many other countries) do overglorify careers and pushing onesself to the limit and beyond. While it’s good and healthy to have goals, it does need to be tempered with the needs of the body, soul and spirit. I really appreciate when the article said, “If we find that we cannot allow ourselves to experience and enjoy the present moment, putting pleasure off into some distant future, it may be a sign that we are being driven to achieve more than is truly necessary.” It is a good strategy for rebalancing ourselves when we are too close to the source of the instability to accurately judge when we’re going too far. Peter is right in that parents need to guide children until they learn to do this themselves, instilling in them the need to have this skill.